This week on The Digital Story photography podcast: GoPro HERO3+ Black Edition tops the Weekly Update; Taking the Transporter Sync for a Spin; From the Screening Room: Chris Orwig, Lightroom 5 Essentials; and on the Nimbleosity Report: the Square Perfect Backdrop System- All of this and more on today's show with Derrick Story. Story #1 - The Weekly Update: Hands-on with the GoPro Hero 3+ Black Edition (DP Review) Supports 4K, 2.7K, 1440p & 1080p Video. "It has better battery life, quicker Wi-Fi speeds with longer range, is more compact with the new case, has a significantly improved microphone, and the best image quality I've seen from a GoPro to date." In other news, Adobe Camera Raw release candidate supports 14 new cameras including Sony A6000, Fuji X-T1 (but no corresponding Lightroom update). (Imaging-Resource). And finally, Olympus Patents Impressive 12 and 14mm f/1.0 Ultra-Wide AF Lenses (PetaPixel). Story #2 - Taking the Transporter Sync for a Spin. I've been testing the Transporter Sync ($99) for an upcoming Lynda.com title that I'm working on for backing up your mobile photos. I'm still in the early stages of learning about this device, but I have a few things to share with you now. This is the standalone version of the transporter that doesn't include a hard drive. The thinking is that you add your own USB hard drive and it becomes a transporter. One of the first things to note, is that whatever drive you use has to be completely erased by the transporter before it's available for storage. Once the Transporter has finished configuring the drive is then available for use. You can access content on the drive the a desktop application, web browser, or iOS or android device. Right now I have a portable drive connected to the transporter that uses USB fo its power. I might switch to a drive with its own power supply to see if that increases performance. The iOS app was more basic than I had anticipated. You can add images from your camera roll to your Transporter via your iPad or iPhone. But you can't do anything with them such as rename the file names put them in folders organize them things like that. And in fact, you can't even browse the images by icon. So all you end up with is a list of filenames without any indication of what the subject for the photo is. At this point, I don't see the Transporter replacing services such as Loom that I think have more functionality for mobile photographers. It could be used as a straight back up solution, and I'm exploring that more and will report once I come to some conclusions about it. Story #3 - From the Screening Room - Chris Orwig, Lightroom 5 Essentials. This week's featured artist is The enthusiastic Chris Orwig, who is an excellent Lightroom instructor. 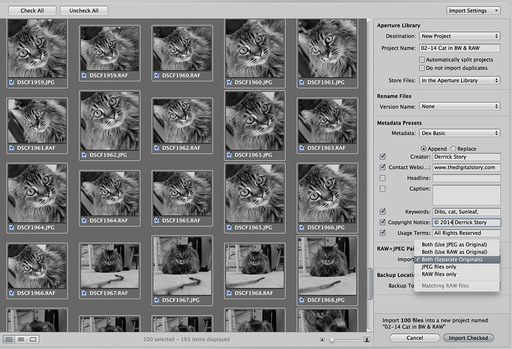 Chris shows you the things that you need to know to really master the basics of Lightroom 5. You can watch Chris in action by visiting the TDS Screening Room at lynda.com/thedigitalstory. While you're there, you can start your 7 day free trial to watch other photography titles, plus every other topic in the library. Story #4 - The Nimbleosity Report - The Square Perfect Backdrop Background Support Stand. 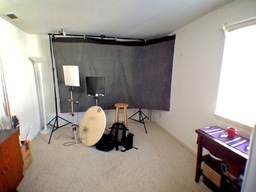 This backdrop frame allows you to set up just about anywhere you have 10 feet of room. Plus it's affordable at lesson $70. And it breaks down to a pretty compact package. I talk more about it in the final segment of today's show. Photo Assignment for February 2014 is Smartphone. In addition to subscribing in iTunes, you can also download the podcast file here (24 minutes). You can support this podcast by purchasing the TDS iPhone App for only $2.99 from the Apple App Store. One of the points we're emphasizing during filming this week for my latest lynda.com title on portraiture, is getting it right at capture. This image of Ashley, for example, has no post processing. It's a RAW file interpreted by Aperture 3.5 and exported as a Jpeg. Before sharing these photos with Ashley, I will do some work on them. But my goal is to make that phase artistic, not corrective. Among the advantages to this approach is making post a fun activity, and the ability to show the subject images during the shoot that inspire confidence. This leads to even better photos as the session moves forward. For this pose, I used an off-camera flash on stand and a white fill reflector. The sun was behind the subject creating some nice back highlights. I mounted the Canon 85mm f/1.8 prime set to f/3.5 on a Canon 70D. ISO 100. I'm hoping this title on photographing teens will be released in early Spring this year. I'll keep you posted. Most of my portrait work is outdoors. But there are those assignments where I need to set up indoors. With my portable studio kit, I'm able to fit all of the equipment in the back seat of car. Here's how I do it. 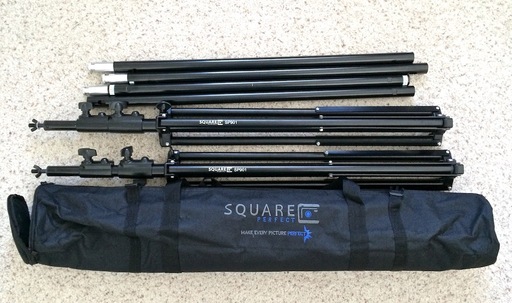 At the heart of my set up is the Square Perfect Background System ($65) that's quite sturdy, yet folds up into a single over-the-shoulder bag. I also like the Lowel Ego Digital Imaging Fluorescent 2 Light Kit (kit is $269 with stands and clamps). 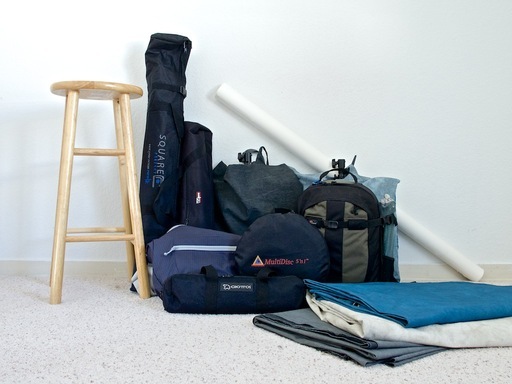 I then add a few backdrops, stool, reflector, tripod, and of course my Lowepro backpack with camera gear and Speedlights. When it's all folded up and ready for transport, the studio looks like this. Now all I need is a 10'x12' space, and of course, the subject! This studio set up has a high Nimbleosity Rating. What does that mean? You can learn about Nimbleosity and more by visiting TheNimblePhotographer.com. 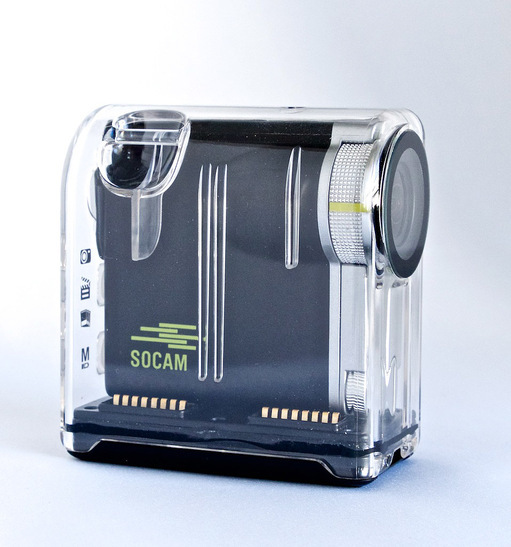 A new entry in the action cam arena is the SOCAM UltiMate, due for release in April. The unit I'm testing measures 3.25" wide by 3.5" tall in the water-tight housing. The camera itself with no housing measures 2.75" wide by 2.75" tall. The rotating lens feature is handy. You can mount the camera as needed, then rotate the lens for the best composition. 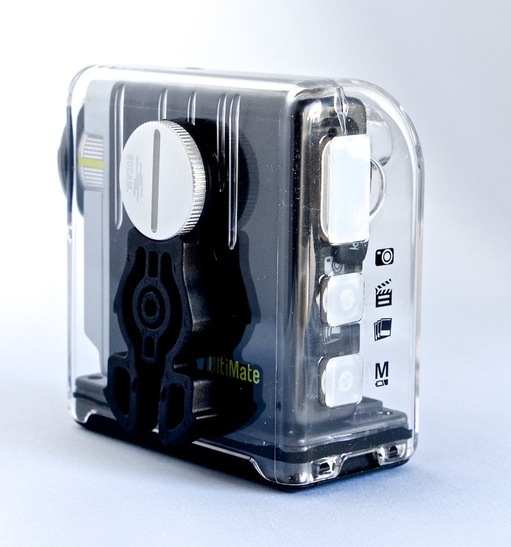 You can't, however, rotate the lens when the camera is in the water tight housing. There are four ports: USB, external mic, HDMI, and an accessory port. A standard tripod socket is on the side of the camera. That socket is also used for the included accessory mounts. Video files are written to a micro SD card in the .mp4 format. Quality was quite good in initial testing. 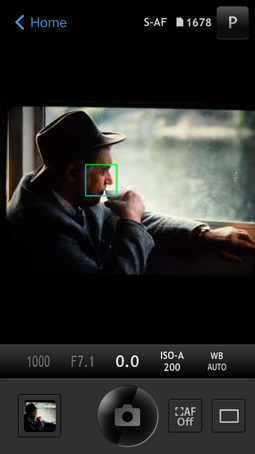 You can connect the camera wirelessly to your iPhone via its built-in WiFi and free SOCAM iOS app. I was able to get the two devices talking, but I need a bit more testing before sharing an opinion about the tandem's performance. I'll have more to report after further use. But if you're looking for an affordable action cam, you might want to keep an eye out for reviews on the SOCAM after it's released in April. This week on The Digital Story photography podcast: Sony a7R full review tops the Weekly Update; Build Your Own DIY Slide Digitizer; From the Screening Room: Julieanne Kost on Photoshop CC Essential Training; and on the Nimbleosity Report: How I dropped my iPhone from the top of the bleachers, and what happened after that - All of this and more on today's show with Derrick Story. Story #1 - The Weekly Update: Full Review of the Sony a7R (DP Review) "When it comes down to it, the Sony a7R's image quality, created by a combination of its high-resolution sensor and premium quality optics, make it an impressive image-maker." Next, Nikon facing potential class action lawsuit due to D600 sensor oil issues (Imaging-Resource). And finally, we've got some specs and price information for the upcoming Pentax 645D CMOS Medium Format camera. It's going to cost about $10,000 and sport a 40-50-megapixel sensor (PetaPixel). 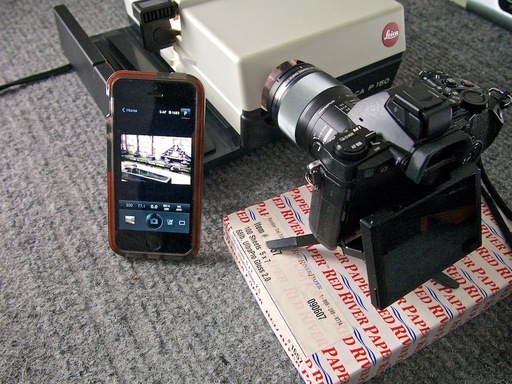 Story #2 - How to make a high quality slide digitizer with an old projector and a new camera. I'm getting excellent results with the Olympus OM-D E-M1 and the Olympus 60mm f/2.8 macro lens coupled to an old Leica P 150 projector. I cover why I chose to go this route, and how I assembled it. There'sd also a companion article titled DIY Slide Digitizer with Olympus OM-D and Leica Projector with how-to pictures and sample scans. 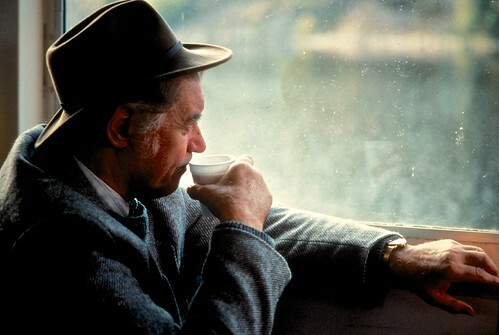 Original image captured in 1992 on Fuji 100 slide film. Story #3 - From the Screening Room - Julieanne Kost: Photoshop CC Essential Training. This week's featured artist is one of the best Photoshop instructors I've ever listened to. Julieanne is an excellent photographer, so she knows the capture side of the equation too. And when she teaches, she's precise and adds plenty of wit and humor. You can watch Julieanne in action by visiting the TDS Screening Room at lynda.com/thedigitalstory. While you're there, you can start your 7 day free trial to watch other photography titles, plus every other topic in the library. Story #4 - The Nimbleosity Report - The Story of my Dropping an iPhone 5S from the top of the gym bleachers. When you're out shooting with your interchangeable lens camera, remember to pull out your iPhone and snap a photo too. Why? 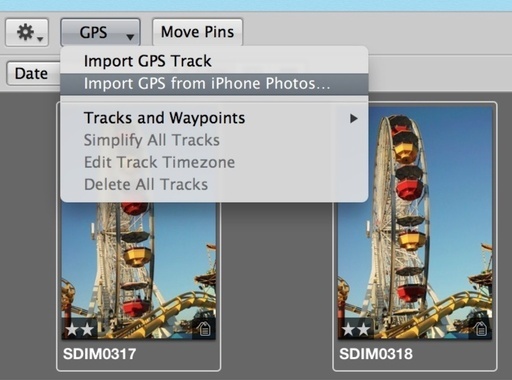 Because your iPhone will log the location data that you can easily transfer to the corresponding images in Aperture. In my latest Macworld Magazine article, Geotagging the easy way with Aperture 3.5, I explain three ways to add location data to the images you already have in your Aperture library. I love the iPhone method. It's so easy. But if you haven't captured location data with it, you can use the geotagging tools built in to Aperture to accomplish the same goal. It's particularly fun for vacation and business trips. One of the reasons why I often shoot RAW+Jpeg is to take advantage of in-camera effects or film simulation modes. 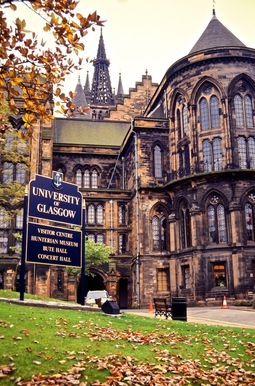 The images with effects are saved as Jpegs. The master files are in the RAW format. By capturing those RAW files too, I have fully editable images to further experiment with further if I wish, especially if I don't like the way the Jpegs turned out. Both images captured at the same time with a Fujifilm X20 compact camera. 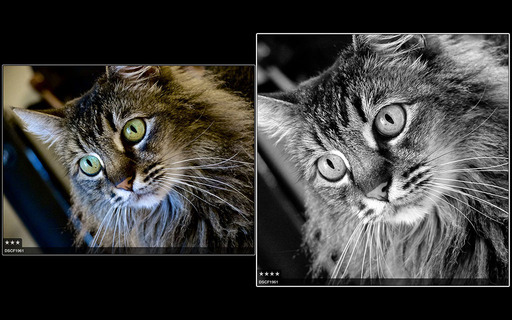 Picture on the left is the RAW file, and on the right is a B&W recorded using Fujifilm's Film Simulation mode. By shooting RAW+Jpeg, I get both files. Photos by Derrick Story. When it's time to upload these files to Aperture, I choose "Both - Separate Originals" for my RAW+Jpeg pairs. I *do not* recommend using the other Pairs settings because the files get linked together. This proves to be a problem up the road. Import as "Both - Separate Originals". 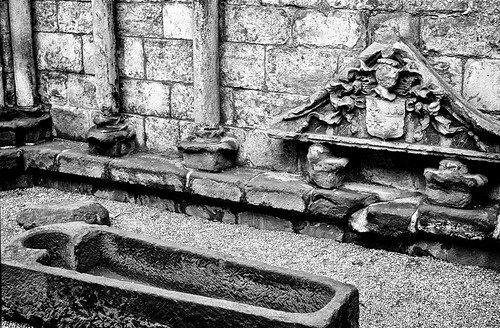 Don't be fooled that the RAW files are B&W at this point. 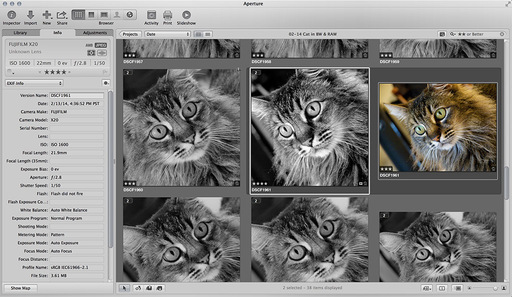 Aperture is just reading the embedded Jpegs. Once the files are in my Aperture library, I select Auto Stack (Stacks > Auto Stack) and set the timing to 0:01. This creates a pairing for each of my compositions - one Jpeg with one Raw. If I want to tidy up the library, I can Close All Stacks (Stacks > Close All Stacks), and I only see one version of each pair. You even have control over which version by using the Pick command. Jpegs and RAWs now side by side in Stack mode. By using this technique, I'm more willing to experiment with the interesting effects included in my camera because I will always have the RAW file too. Use this technique to explore the unique features of your camera. 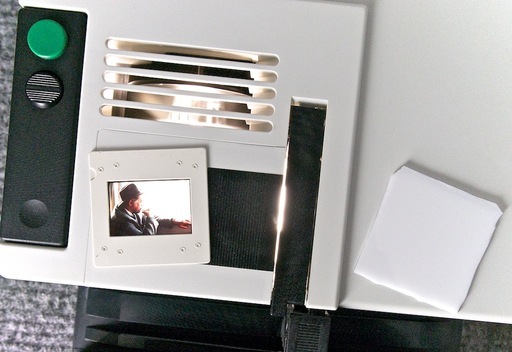 What to do with our old Slide Projectors? 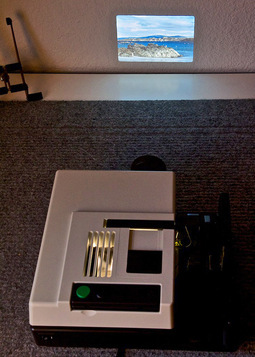 I just read a terrific article on PetaPixel about converting a slide projector into an automated digitizer. And it got me thinking... what can I do with mine? I have a wonderful Leica P150 projector that I loved in the film days. It's still in perfect shape and projects beautiful images. But I'm not using it. So I started thinking about this. I could use the P150 to project images in the studio for interesting composites with live subjects. I could take a whack at converting it into a slide digitizer. The projector could be an interesting light source for photo projects. I have the Leica projector out on my workbench. So I'll keep toying around with ideas. If something comes to mind for you, please share the idea on our TDS Facebook page. This week on The Digital Story photography podcast: the Panasonic GH4 tops the weekly update; The inside scoop on c't Digital Photography Magazine; From the Screening Room: David Hobby on The business of photography; and on the Nimbleosity Report: Pro HDR for iOS - All of this and more on today's show with Derrick Story. Story #1 - The Weekly Update: Panasonic announces 4K-capable Lumix DMC-GH4 (DP Review) Are you ready for 4K video? (4K has a horz. resolution of 4,000 pixels compared to 1,920 for HD). Speaking of Panasonic, looks like Olympus is using their sensors, not Sony's in the flagship OM-D E-M1 (Imaging-Resource). And finally, it looks like the Nikon D4s will be officially released soon. The body alone will run you about $6,000 (PetaPixel). Story #2 - The Inside Scoop on c't Photography Magazine. It all began with a conversation in Germany in 2012. More than a year later, I'm an Associate Editor with this technical photo magazine based in Germany. (You can subscribe for $39.96 using this special URL.) Here's what I'll be doing for this terrific publication. 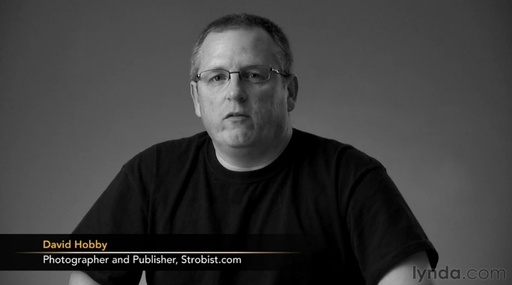 Story #3 - From the Screening Room - David Hobby: Insights on Building a Photography Business. This week's featured artist is also known as Strobist. In this movie titled, "Determining your career compass point," David talks about his own career evolution and how establishing a compass point facilitates the process. You can watch David in action by visiting the TDS Screening Room at lynda.com/thedigitalstory. While you're there, you can start your 7 day free trial to watch other photography titles, plus every other topic in the library. Story #4 - Pro HDR ($1.99) for iOS. High Dynamic Range photography is fun, but it's also a fair amount of work... that is unless you're using Pro HDR on your iPad or iPhone. I explain why in this fourth segment today.